The other day I had been asked to go and sign a couple of books for a pal. We'd arranged to meet almost on the banks of the river so, never one to waste a chance, I stuck the rod and the bag in the back of the car. It was a beautiful, sunny afternoon and very pleasant despite the brisk easterly wind. The rod was still set up from my last trip with the new Mitchell reel and twenty pound Nanofil. On the end of the line was a wire trace and a size 4 Ondex spinner. I made my way downstream fishing in all the likely spots but apart from a few follows from small perch and one good chub which came unstuck on the way in there was nothing doing for half-an-hour. At this point I reached the deep pool where I'd landed my seven pound chub the other week. I was fishing from a high bank and I fanned my casts out across the pool starting from the top end and working downstream. My last cast was almost straight down my own bank past clumps of reeds and fools cress. I could feel the spinner throbbing along nicely as I slowly reeled it in. The lure was almost half way back when it stopped with a jerk. "Fish?" I thought. Sure enough the taut line began to swing out from the bank as whatever had taken the lure started to move away. Could it be another big chub? A flash of green flank answered the question, it was a pike and a decent sized one too. The clutch of the little reel buzzed as line was dragged off the spool and I tried to steer the fish away from the branches of overhanging bushes. Several times it tried to forge upstream but I was able to turn it and bring it back into the pool on every occasion. It was beginning to tire a bit and I began to wonder how I could get it out. When I landed the big chub the hooks of the lure became snagged in the reeds and I'd had to slither down to the water's edge and retrieve it from there. "Could I do something similar with the pike?" I eased the snout of the fish up and by applying maximum pressure I was able to slide its head onto a mat of fools cress. Now I hung on waiting for the pike to make a move. As it swished its tail I heaved again and it slid a little further onto the vegetation. A couple more swishes and heaves and its whole body was out of the water. Just in case it managed to escape I took a couple of pictures as it lay there. Now for the tricky bit. With the rod in my left hand I slid cautiously down the steep, grassy bank towards the fish, hanging onto a clump of nettles with my other hand to steady myself. 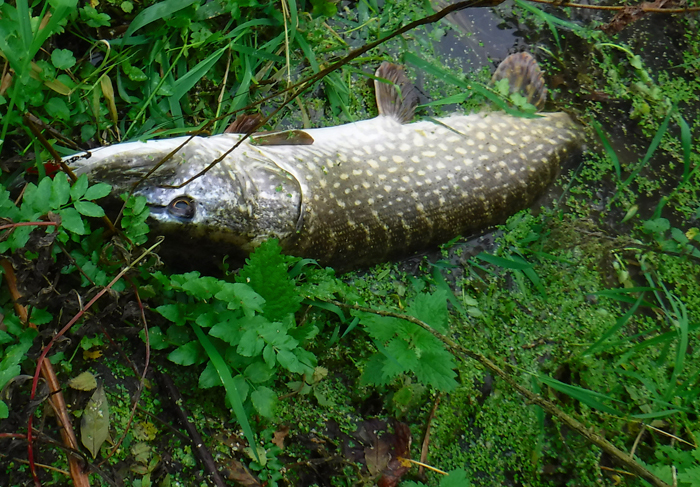 Somehow I had to get hold of the pike and lift it up to be unhooked and released. As I was pondering the problem a voice from above said " Hello Mike!" My friend Stuart, a member of the same angling club, just returning from a chubbing session, had seen me messing about and was leaning over the barbed wire fence at the top of the bank. "Can I help?" he said. 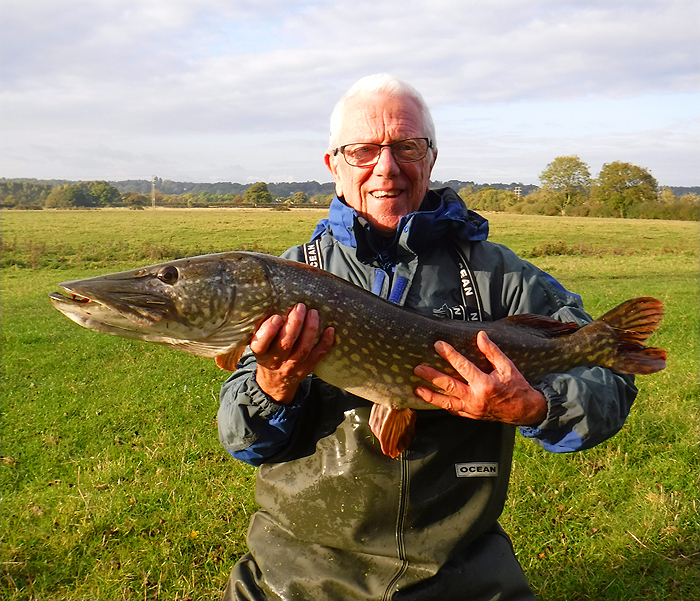 I replied that I'd be glad of anything he could do, so he pushed his long handled landing net towards me and suggested that I try to put the pike in it. I opened the bale arm of the reel and set the rod down in the nettles above my head. Now, very carefully, I reached down and slipped my fingers into the gill covers of the fish, avoiding the hooks and trying not to plunge into the deep water. With the soft muddy bank crumbling under my feet I took the tail wrist of the fish in my free hand and lifted. By doing a sort of clean and jerk I was able to propel it up towards the outstretched net. Although it was a very nice net it was chub sized rather than pike sized, so it took a couple of trys before I could fold the fish into it. Phew! Success!. I unhooked the pike and my pal weighed it at over sixteen pounds before taking a couple of pictures of me carrying both the pike and a broad grin. As I've always said it only takes one fish to make an excellent session. 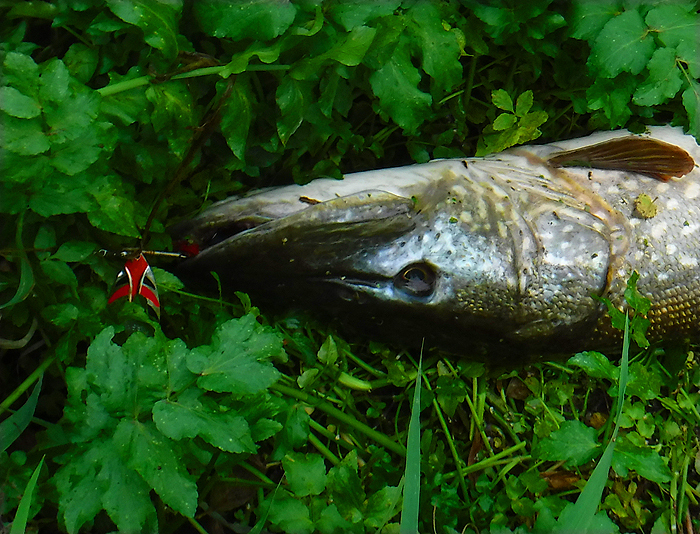 With a bit of help the pike's wriggled its way onto the fools cress. Nicely hooked on the big Ondex spinner. My best pike so far this year (I haven't caught many).